Anonymous winner: "It's nice to have this much to fulfill my dreams"
(CNN) -- Concerned about her family's finances, a university student in Australia cashed some long-forgotten lottery tickets this week -- hoping the money would help her parents. Have you ever won big after mislaying a lottery ticket? Tell us -- click on Sound Off below. She discovered their worries are over. The university student won $10 million (A$13 million) -- and helped solve a lottery mystery that has made headlines in Western Australia for 10 months. "People had been wondering for months, who is this mystery winner? Do they know about this ticket?" said Jodi Eastman, spokeswoman for Lotterywest, the state lottery. "We have a 12 month expiry on lottery tickets. And people thought it might end up expiring and go unclaimed." It would have, too, had the student -- who is in her 30s and asked lottery officials to keep her anonymous -- not woken up earlier this week, suddenly remembering the bundle of lottery tickets collecting dust in a drawer. She didn't know that among them was a gift from her father, who had purchased a ticket to test the family's luck when the Oz Lotto jackpot climbed to $39 (A$ 50 million) million last July. "She said she thought, 'If I can win some money on these tickets, I can possibly help the family out," Eastman said. The first couple of tickets yielded small amounts -- $16 total. "She was pretty excited," Eastman said. Then the woman had the clerk check the gift from her father. At first glance, she thought she'd won $10,000 (A$13,000). No, the retail store clerk told her, it's $10 million (A$13 million). "I checked the commas and decimal places and then I realized," the woman told Lotterywest. "I always remember Mum telling me that if I won the Lotto, not to start jumping up and down in the shopping center," she added. Had she waited two more months, she would have missed the fortune. 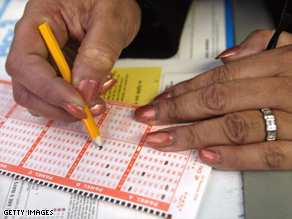 The woman told lottery officials she's not planning a spending binge. "The people close to me will be looked after and I might give some to research or a charity of some kind," she told Lotterywest. "It's nice to have this much to fulfill my dreams and the dreams of the people around me." The winning ticket cost $6.70 (A$8.70). The odds she beat: 1 in 45 million.